Compared to most countries in Asia, Cambodia is a small country, less than 2/3 the size of Italy. Following a long and catastrophic civil war, Cambodia has opened up to tourism via a stress-free and relaxed atmosphere mirroring that of its neighbour; Thailand. The main attraction is still the archaeological site of Angkor, but the country also boasts a stretch of coastline with magnificent beaches that has not yet been discovered by international tourism. Cardamom and Dâmrei Mountains – Including the western mountain range (reaching 1,500m), beaches on the gulf and islands. Major landmarks include: Battambang, Kampot, Koh Kong, Pailin, Pursat, Sihanoukville, the Bokor National Park and Kep. Northwest Region – which is home to the location that draws the largest number of tourists visiting Cambodia: the archaeological site of Angkor. Other interesting locations include; Anlong Veng, Siem Reap, Sisophon, Koh Ker, Poipet, Tonle Sap Lake and Preah Vihear. Central Valleys and Mekong River – Bordering with Thailand and Vietnam and the location of the capital Phnom Penh and also Kampong Cham, Kompong Thom and Krek. The Mekong River dominates the country’s hydrology. TRAVELLING ALONE OR WITH A COMPANION? Once again, it depends on personal travel experience. Those who are familiar with the Asian continent will certainly be able to “face” Cambodia with both caution and the right attitude. Those who have travelled mainly through Western countries should opt for an organised motorcycle tour or, if travelling with a group of fellow motorcyclists, opt for a 4×4 guided tour. A passport must be valid for at least six months from the date of arrival into the country, but this period could vary depending on the agreements that exist between individual countries and the Cambodian Government. Whilst staying or travelling through Cambodia, it is essential to always carry a certified copy of your passport. Providing, of course, that your motorcycle tour will return to the starting point where your original passport can be left safely. Visa: It is also necessary to obtain a Visa and this will be issued by the Cambodian diplomatic-consulate located in individual countries. For short stays, a Visa can also be issued at land borders or upon arrival at any of the international airports. To apply for a Visa, a visitor needs two 4x6cm passport size photos taken with a white background. The cost of the tourist visa (Type “T”) is around $30US, lasts 30 days and can be renewed for one additional month. If you want to be on the safe side, a Visa can be requested prior to departure following the online procedure on the website: www.evisa.gov.kh. (by scanning your passport and photo ID plus providing payment be credit card). 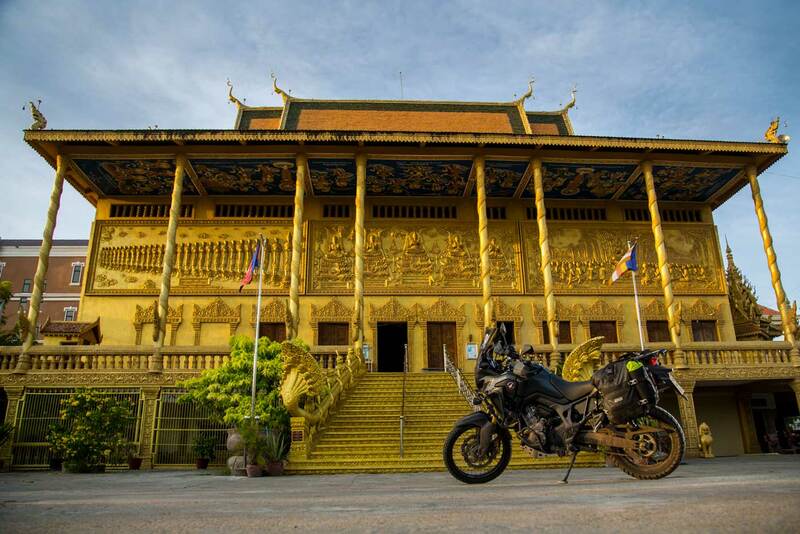 Those who have included Cambodia in a larger Asian motorcycle tour will be able to enter the country at a land border crossing with Thailand, Laos and Vietnam. Each border crossing has the facility to issue a Tourist Visa, although some do not recognise the validity of the Tourist Visa purchased online. See below a list of all border crossings. Thailand: Cham Yeam, in the province of Koh Kong; Chorm, in the province of Oddar Meanchey; Daung, in the province of Kamrieng Battambang; Then Pet, in the province of Banteay Meanchey; Prom, in the province of Pailin; O Smach, in the province of Oddar Meanchey. Vietnam: Bavet, in the province of Svay Rieng; Kaoam Samnor, in the province of Kandal Mekong; Phnom Den, in the province of Takeo; Trapaing Sre, in the province of Kratie Laos: Dong Kralo, in the province of Stung Treng. Those who decide to hire a motorcycle locally can use one of the four International Airports in Cambodia ie Phnom Penh, Siem Reap, Preah Sihanouk and Sihanoukville. US Dollars is a foreign currency that is commonly used. We recommend obtaining a quantity of small value bills. ATM / Cashpoint machines for Visa and Mastercard are commonly found in large cities across the country. Driving licence: to drive around Cambodia, an Internation Driving Licence is required and on paying a fee of $25US, it can be converted into a Cambodian Licence. Most roads in Cambodia are in a poor condition and in rural areas, there is no street lighting at all. It is normal for vehicles to have no lights and in the main cities, the traffic can be quite chaotic so it is vital to take extra care when riding. Outside large cities, street signage is almost exclusively in the local language and without the assistance of a navigator or guide, a rider can risk becoming lost several times in just one day! The Cambodian Tourist Office (see below under “Useful Information”) provides e-brochures on the different areas of the country as well as downloadable maps. One more word of advice….when riding through Cambodia do not hold back on honking the horn, as every rider should make themselves as visible as possible. Do not challange the rain when it arrives as the roads can become a river and unsafe for riding so just stop and wait for the rain to stop and usually allowing an hour for the rain to pass is sufficient. Cambodia drives on the right. It recently became mandatory for motorcycle helmets to be worn but at best, only the rider wears one as the cost of purchasing a second helmet for a passenger is an unjustifiable expense for most Cambodian families. Every rider should not only be wary when travelling on Cambodian roads but also when it comes to selecting a motorcycle rental shop. We are still receiving reports of untrustworthy companies where fleets of motorcycles are made up of unchecked vehicles that are unsafe for road use. Whilst the country is currently enjoying an era of peace and internal stability, the political situation has deteriorated as in September 2017 the leader of the opposition party, Kem Sokha was arrested and this could give rise to civil unrest at any time. It is recommended that foreigh visitors avoid large gatherings especially in Phnom Penh and follow political developments through the media or by asking hotel staff. If travelling alone and away from the regular tourist routes, proceed with extreme caution in areas where there are still landmines and unexploded bombs but this is not always reported. Avoid paths in remote rural areas and even those near archaeological sites. Due to a border dispute with Thailand that is yet to be resolved, travel to the province of Preah Vihear is not currently recommended. Micro-crime is reported at Angkor Wat and in the town of Sihanoukville, a city overlooking the Gulf of Siam, the origin being the high number of tourists and foreign residents. If not travelling in an organised group, always report your daily movements and itinerary to a third party. Beware of guides who approach you offering their services, as they are often unapproved, unauthorised and inexperienced. It is also important to note that are severe prison sentences for drug use, even for the use of “soft” drugs. Neighbouring countries: Laos, Thailand, Vietnam. Religion: Thearavada Buddhism is the official religion. Currency: Cambodian Riel (KHR). 5.000 Riel correspond to 1.24 US dollars. The dollar currency is accepted almost everywhere as well as the Thai Baht. The main credit cards are accepted in hotels, shopping malls, shops and restaurants in major cities. Mains: 220V. 50hz. The mains power frequency is not very stable. Telephone: The area code to call in Cambodia is +855 (0) 23. There are five mobile service providers in Cambodia: MobiTel (T) 012, Beeline (T) 090, Smart Mobile (T) 010 and 016, Cube (T) 013, MetFone (T) 097. MobiTel is the most widespread network and has transmitters in all major cities, although reception is still limited within the city limits. Tourists can buy a Sim Card for their mobile phones at the arrival terminal of all Cambodia airports and border checkpoints. Internet access: internet access can be easily found in Phnom Penh or Siem Reap (in internet shops and coffee shops at $1US an hour). Wi-Fi is available in most hotels, restaurants, Mini Mart, Cafés and shopping malls. www.tourismcambodia.com – Email: info@tourismcambodia.com. The office provides a wealth of information in English as well as brochures and downloadable maps. Tourist information centre in the capital: Preah Sisowath Quay, right in front of the Court of Appeal. Consular Correspondent in Phnom Penh: Dr. Cannetta – Cell: +885 (0) 17540544. There is no Cambodian tourism office in Italy. Facilities and standards are not comparable to those found in European countries. It is recommended that foreigh visitiors should only visit a hospital for minor complaints / problems or to facilitate repatriation or the transfer to a neighbouring country (we recommend Thailand). Due to vulnerable healthcare and hygiene conditions, visitors should always be careful with food and beverages. Avoid a “motorcycle stay/drive” visit to Cambodia if you have a poor or fragile state of health. Illnesses: those typical of the Asian area (include Plasmodium Falciparum Malaria, (except in the area of Phnom Penh city) and Dengue Fever. Always take preventive measures against mosquito bites. For a longer stay, Anti-Hepatitis A + B and Anti-Malarial Prophylaxis may be appropriate. The last case of Bird Flu (H5N1 virus) was reported in February 2013. Returning to food, as a precautionary measure avoid meat and poultry eggs and only eat poultry if it is well cooked. In rural areas, cases of the “Zika Virus” were detected and this is a viral disease transmitted by the “Aedes Aegypti” mosquito, also responsible for “Dengue” and “Chikunguya”. Before departing for Cambodia, it is highly recommended to purchase travel insurance that covers medical expenses and repatriation or transfer to another country in the event of illness or accident. Vaccinations: Yellow Fever vaccine is mandatory, but only for travellers from countries at risk of transmission. Light but technical clothing. Rain suit, open or full-face helmet. If arriving by land you will certainly have equipment specifically designed to tackle asphalt and dirt paths. In case of hiring a motorcycle locally, it is also important to obtain information about hiring all the necessary accessories. An alternative is to fly to Cambodia with luggage that can be mounted to the pre-hired motorcycle, where a rider might also install an emergency / accessories kits which will include a charger for a smartphone / GPS, photo / video camera and / or tablet and any related item. A 30-litre backpack with comfortable shoulder straps would be useful on many occasions, as well as a waist bag to wear around the waist, with compartments for tools, documents and other small items (see the new GIVI GRT710 Gravel-T line). In Cambodia, a litre of gasoline will cost an average of 3.752 Riel (price correct as at Nov 2017). The country is located completely within the tropics with its most southern point being just 10° above the equator. The climate is tropical-monsoon, warm and humid with heavy rains August-October and with more moderate temperatures November-March. The rainy season is from May to October. If your journey to Cambodia clashes with the rainy season, it is vital to always keep up to date on the weather using the website; http://www.cambodiameteo.com/map?menu=3&lang=en . Scooter rental only ranging from 50 to 150cc. Repairers of motorcycles and scooters who also rent motorcycles and scooters. In addition to classic scooters, some medium-sized enduro motorcycles are also available. # 48 Bis, St.480, Sangkat Phsar Deum Tkov, Khan Chamcarmon, Phnom Penh. On the website there is a series of tours in various parts of the country, with details of prices, driving difficulties and types of motorcycle available for hire. There is no shortage of testimonies and articles published in the press. Their fleet includes Honda XR250, WRF 250/450, Africa Twin 750 and Transalp 650.
www.rentalmotorbike.com. Both a UK phone number (+44 203 769 00 23) and a US phone number (+1 201 478 89 64) are provided. In order to make contact via e-mail, you will need to complete an online form. This well-known international organisation also has a presence in the Cambodian capital. There is usually a wide variety of motorcycles in their fleet but currently, it is limited to just two vehicles; the 110cc Yamaha Legenda scooter and the Honda Enduro XR 250 Tornado. The website has details on rates and how to book a vehicle.